It's Bollywood's coolest twin story. Hema Malini's work in Seeta Aur Geeta remains one of her most endearing performances, and the film remains a timeless 70s classic. With Seeta Aur Geeta all set to get a television makeover, here's a look at what made that 1972 film so special. It was quite the lineup. Ramesh Sippy, directing a script written by none other than Salim-Javed, and with music by RD Burman himself. And the casting too was perfect, from Hema in that iconic double role to Sanjeev Kumar and Dharmendra, with the inimitable Manorama as the evil aunt. Seeta Aur Geeta, as you are all aware, is about identical twins separated at birth. Based loosely on The Prince And The Pauper, the film deals with Geeta, a spunky girl raised in poverty as a street performer and Seeta, who grows up in a wealthy house to a wicked aunt. Seeta goes to commit suicide, but is rescued and mistakenly taken to Geeta's house -- meanwhile Geeta barely escapes Seeta's vile aunt and uncle. The result is catastrophic. Raka (Dharmendra), Geeta's fellow performer, can't digest the change in her character and is charmed by her suddenly domesticated demeanor, while the real Geeta goes off with Sanjeev Kumar, who can't believe how much Seeta has changed. 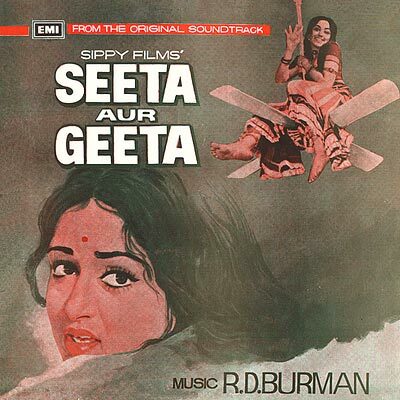 RD Burman crafted a sensational soundtrack for Seeta Aur Geeta, with smash hit songs like O Saathi Chal, sung by Asha Bhosle and Kishore Kumar, Abhi To Haath Mein Jaam and Koi Ladki Mujhe Kal, sung by Manna Dey and Zindagi Hai Khel, sung by Manna Dey and Asha Bhosle. Also strikingly memorable was Han Ji Han Maine Sharaab, sung by Lata Mangeshkar, and pictured on Hema's ebullient, intoxicated Geeta. There have been several variations on the twins-separated-at-birth theme, but none remains as endearing as the one by Hema Malini, the dreamgirl perfect as both the repressed and meek Seeta as well as the fiery and defiant Geeta -- with both characters eventually learning from each other's circumstances and growing into well-rounded people. Seeta Aur Geeta fittingly earned Hema her only Best Actress Filmfare Award. The most flattering thing one can say about a movie is to consider it timeless, and Seeta Aur Geeta continues to amuse, even when remade for the 90s. Sridevi -- the modern day Hema Malini, a screen goddess who just happened to be a voluptuous dancer with a peculiarly 'amusing' South Indian accent -- stepped into Malini's shoes for this inspired remake by director Pankuj Parashar, also starring Rajnikanth, Sunny Deol and Rohini Hattangidi. And all it proved was the story could never get old. So here we go again. Watch Seeta Aur Geeta from May 25, on Mondays to Fridays at 7:30 pm on NDTV Imagine. Great TV shows coming up! Anjori Alagh takes on Hema Malini!